You know how the biggest authors are treated like rockstars? Constant coverage in the tabloids, fawning from those in the know, shameless flirting from normally demure and classy women, and adulation from all? Regardless of reality, Peter Fallow (Bruce Willis) is a rockstar author. And all because two white people missed a freeway exit. But I digress. Sherman McCoy (Tom Hanks) is the 80s Wolf of Wall Street, a trader extraordinaire riding the hottest of hot streaks. He has the big house, the flash car, the doting wife… And Maria, the requisite slutty mistress. It is while indulging with Maria that a simple wrong turn leaves them in the wrong place at the wrong time. “Where are the white people?” gasps Maria. In their hasty exit from the situation a man is injured. A black man. The trumped up case that ensues isn’t between defendant and accused, it is a face off of blatant stereotypes; the rich and privileged white devil, vs the poor and disenfranchised black guy. It is Fallow that makes the case more than it is. He papparazifies things. Convenient facts are ignored, sludge and sleaze both dredged up in equal proportions. Once the situation is inflamed, the media circus arrives, right as the facts exit. 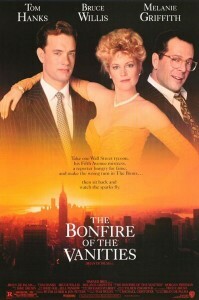 The Bonfire of the Vanities wants so desperately to be an insightful examination of the class struggle and race relations, but the characters are woefully miscast and any potential realism is suffocated under the weight of lazy stereotypes and bad decisions. Willis remains in cocky and confident Moonlighting mode for the duration, a muck-raker done good. Scum turned saint. Tom Hanks is woefully miscast as the smarmy McCoy, the man can’t do nasty, and couldn’t be unlikable if he tried. Setting him up as the fall guy destined for a descent into madness was never going to work. Perhaps overcompensating in order to portray McCoy as the rich bad guy, the film turns the casual racism dial up to eleven, and has Hanks turn to petrified jelly in about as many minutes. In reality he’s a guy guilty of no more than cheating on his wife. The film would have you believe he isn’t smart enough to save his career by simply copping to the fact. Sure his wife might not be happy with the news, but she’ll still be rich. And I mean in hindsight McCoy would have been well served in ditching Melanie Griffith, who was only ever deemed ‘hot’ thanks to her willingness to portray slutty women willing to disrobe at a moments notice. The Bonfire of the Vanities is all the overblown mess it is made out to be. While it isn’t the all time stinker some claim, in terms of bang for the (considerable) bucks, it is a shocker. Final Rating – 5.5 / 10. Heavy handed and ill conceived. For the record; not every rich white guy is bad. Not every black guy is a lying criminal. This entry was posted in Bruce Willis, Crappy Movies, Film, Movie Reviews, Superstars. Bookmark the permalink.